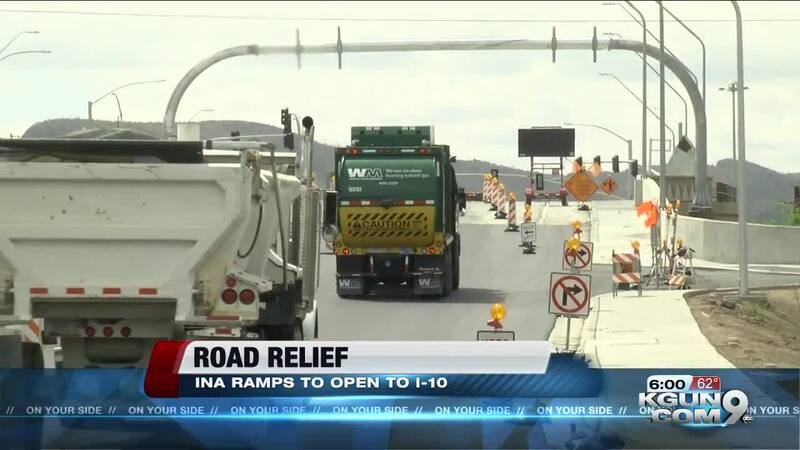 MARANA, Ariz. - It is a project that has been two years----and a lot of driver detours in the making -- the Arizona Department of Transportation is about to open the ramps -- from the new Ina overpass -- to I-10. The opening -- set for Monday -- will be a relief for drivers -- and especially businesses. Ina Road runs through one of the busiest parts of Marana and connects to I-10, the major road through Southern Arizona. At least it used to connect, until the Arizona Department of Transportation closed Ina and I-10 just over two years ago. It's all in the name of faster, smoother travel, without the old intersection where a train crossing could stick drivers with lengthy delays. But the construction called for patience, and a talent for finding good detours. Now Mike Kidder is looking forward to Monday, when ADOT plans to open the ramps to I-10. It'll make it easier to visit his granddaughter Abbey. "That's exactly right. Because she lives up the road a ways and we used to do the Twin Peaks but now we've got the choice now, so.....that's good, we're looking forward to it like I'm sure a lot of other folks are." Without an active entrance to I-10 there's less reason for drivers to come down to the end of Ina, less reason to fight their way through construction and less chance they'll even see a business where they might want to go in for an impulse buy." Customers loyal enough to push past the hassles have kept the Donut Wheel rolling through the closure. Sophia Padilla of Donut Wheel says, “We have a lot of loyal customers. We were able to do some Facebook events and we've had a line out the door when we did that. Our churches, they've always come and ordered every Sunday, without fail." There were still some slack times but now this business and others on the end of Ina can look forward to a smooth trip for old customers and a road to new ones.